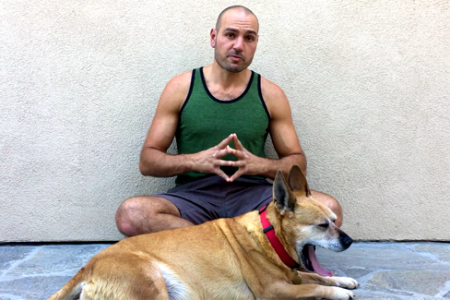 Vision is our primary sense. About 70% of all the sensory receptors in the body are in the eyes and 40% of the cerebral cortex (the outer layer) is involved with processing visual information and making sense of what we’re seeing. 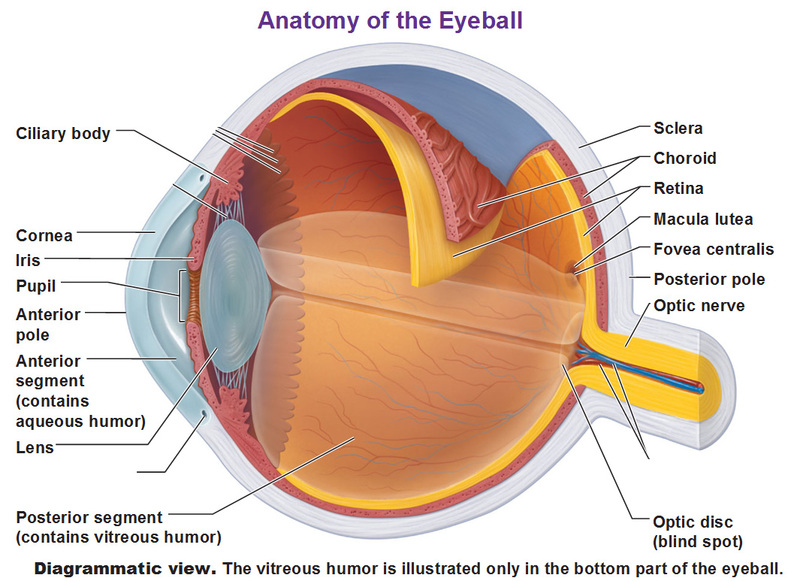 First we’ll start with the accessory structures of the eye then label the muscles and so forth. The conjuctiva is just a transparent, thin membrane covered in mucus on the anterior surface. 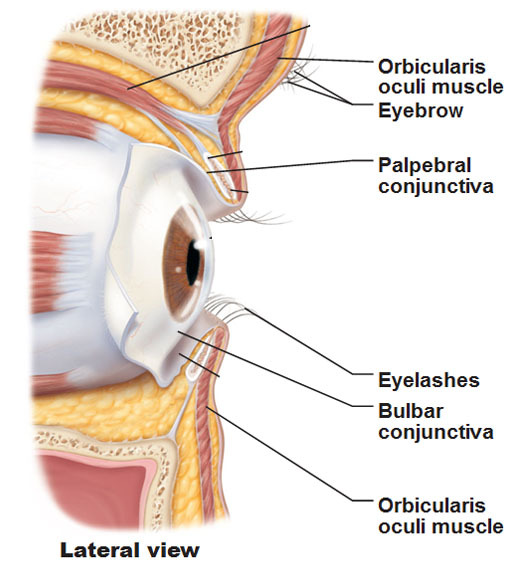 The part of the eyelid you can’t see is the palpebral conjunctiva as it covers the inner lids. The rest of it is the bulbar conjuctiva which covers the white of the eye. 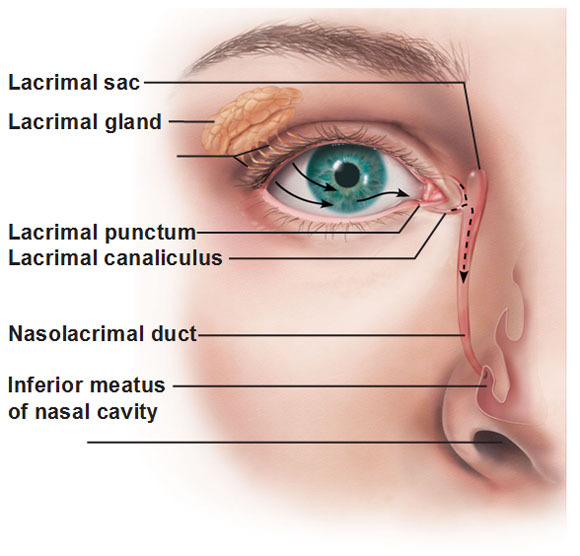 Lacrimal Apparatus: Look below at the location of the lacrimal gland: it’s located superolaterally to the eye. This gland produces tears that keep the surface of the eye moist. The tears travel across the surface of the eye from the outside toward the nose toward these minute holes called puncta lacrimalia. These holes at the corner of the eye where we typically see tears fall down from is actually where drainage occurs. Similar to the storm drain system that tries to prevent rain from overflowing in the streets, they are constantly draining tiny amounts of tears into the nasolacrimal duct. When you produce a lot of tears for any reason, the tears can’t be drained fast enough and they just fall down your face and that’s why people assume the tears are originally produced from the inner corner of the eye. And look where the drain goes… into the nose! The tears are conveyed there from the lacrimal canaliculus (canaliculus means small passageway) into the nasolacrimal duct. It drains into the inferior meatus of the nasal cavity which is why your nose gets runny at the same time when your eyes tear up. That’s also the reason why sometimes one could taste their tears in those situations. This may contribute to a nose feeling slightly runny as well when visine or similar product is applied. 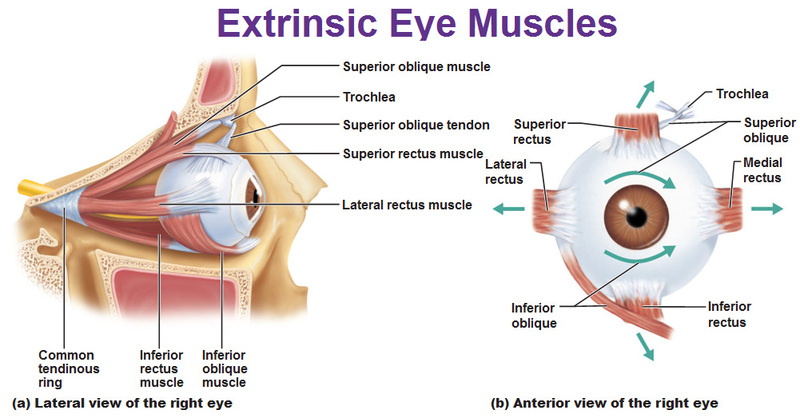 We have 6 muscles that move the eye balls. 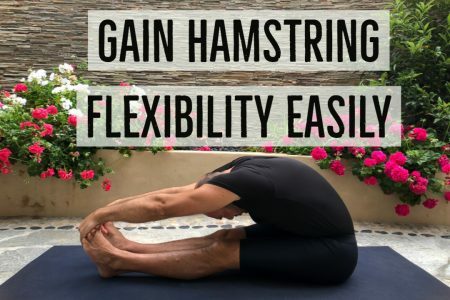 All of them are called recti (rectus is singular, which means straight, just like the straight fibers of the rectus abdominus). 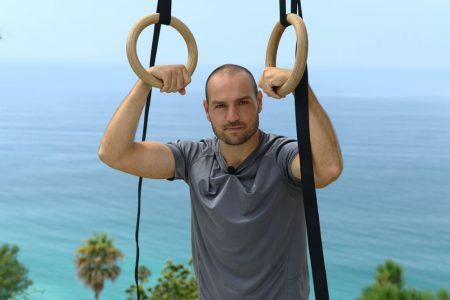 The obliques run diagonally (just like the internal/external abdominal obliques). 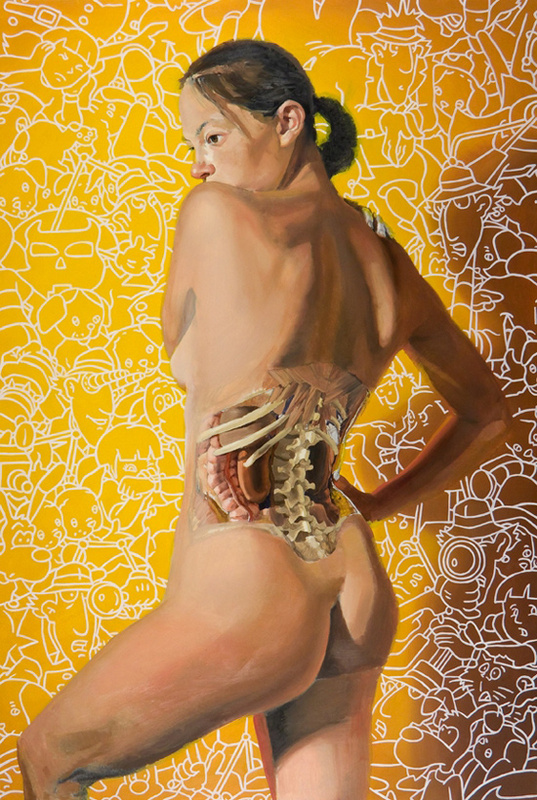 A piece of ligament called the trochlea holds the superior oblique. We’ll start with the outermost layer: Covering the posterior 5/6th of the eye is the sclera. It’s white, opaque, made of dense connective tissue and basically forms the back of the eye ball. The remaining 1/6th is called the cornea. The cornea is still made of dense CT but it’s transparent. The next layer is called the choroid. This layer contains melanin pigment which absorbs the light and darkens the inside so light won’t bounce around inside. 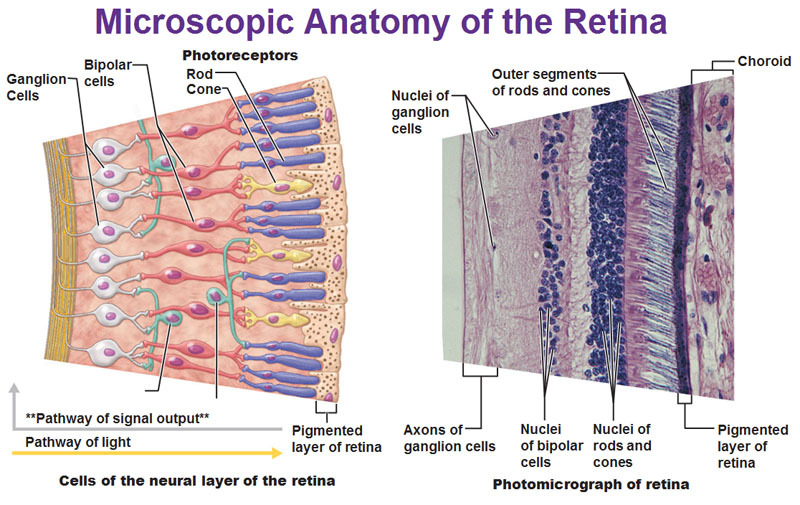 Immediately below that is the retina which contains all the nerves. The front part of the choroid (bunched up with fibers connecting to the lens) is a ciliary body that is composed of a ciliary muscle and processes that look like “guy wires” that help changes the shape of the lens to bend it. Anterior to the lens is the iris. The eyeball is filled with fluid known as vitreous humor in the posterior section and aqueous humor in the the anterior segment. If pigment is only on the posterior part of the iris, it’s blue eyes. If there’s pigment on the posterior and anterior parts, it’s brown eyes. If there’s pigment on the posterior and only a little on the anterior, it’s hazel or green eyes. The iris is controlled by smooth muscle which is a sphincter muscle, innervated by the parasympathetic fibers of cranial nerve III. This is what helps constrict the pupil in bright light. The dilator muscle fibers are innervated by sympathetic fibers from T1-T4 and help dilate the pupil in low light and also during the fight or flight response. The rods and cones are named after their shape. The cones provide high-acuity color vision while the rods are specifically for dim light. When light enters the iris, it passes the retina (the nerves) unaffected and goes straight to the choroid where it then bounces back onto the retina where the light hits the rods and cones. These photoreceptors pick up the light and send signals to the bipolar cells which relay to the ganglion cells that send their axons along the interior surface of the retina toward the optic nerve. 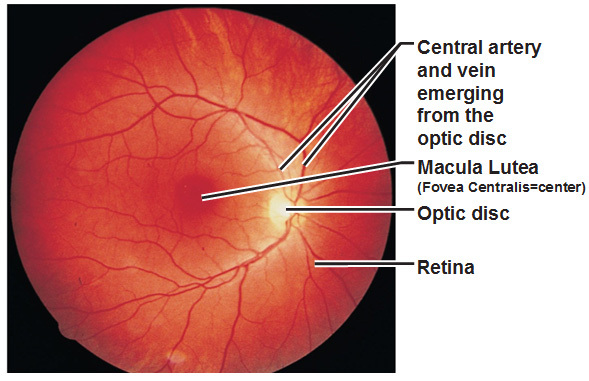 Where all the blood cells come together at the center of the optic nerve there are no nerve receptors. We don’t get light there so that’s our blind spot which we don’t notice that we have one cause we have two eyes that are a couple inches apart and the brain fills in that information. When an eye doctor looks at your eye, this is what they see. 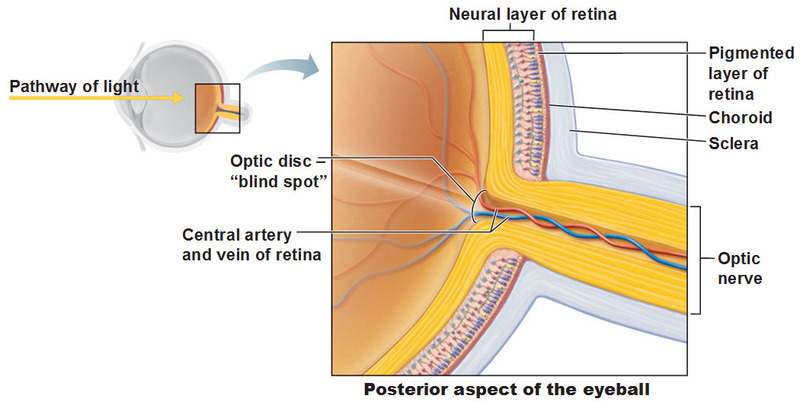 On the back surface of the retina we have bloods vessels and the bright yellow spot is the optic nerve. The eye doctor would look straight ahead at the dark spot called the fovea contralis that contains only cones and picks up vivid colors and is your clearest vision which is why it’s at the center. If you move away from the center but still stay in the dark area, that’s the macula lutea which has mostly cones but some rods too so it can see dim light (which is why you see less color when it’s dark). As you move away from the center, there’s fewer cones and more rods which is why your peripheral vision is never as sharp as your central vision.